...most notable example of which was his Slaughter On 10th Avenue album, that reached No 9 on the UK album charts. Ronson also guested on various different bands' releases after his time with Bowie. He was named the 64th greatest guitarist of all time by Rolling Stone. After leaving Bowie's entourage after the "Farewell Concert" in 1973, Ronson released three solo albums. 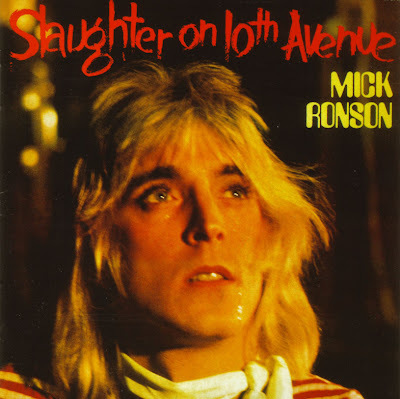 His solo debut Slaughter On 10th Avenue, featured a brave version of Elvis Presley's song, "Love Me Tender", as well as Ronson's most famous solo track - "Only After Dark". In addition, his sister, Margaret Ronson, provided the backing vocals for the set. Between this and the 1975 follow-up, Ronson had a short-lived stint with Mott the Hoople. He then became a long-time collaborator with former Mott the Hoople leader Ian Hunter, commencing with the album Ian Hunter and featuring the UK singles chart hit "Once Bitten, Twice Shy", including a spell touring as the Hunter Ronson Band. In 1980, the live album Welcome to the Club was released, including a couple of Ronson showcases, which curiously also had a few new studio tracks - one being a Hunter/Ronson song. In 1990, Ronson again collaborated with Hunter on the album, Yui Orta, this time getting joint credit - the album was detailed as being by "Hunter/Ronson". In 1993, he again appeared on a David Bowie album; Black Tie White Noise playing on the track "I Feel Free", originally recorded by Cream. Ronson and Bowie had already covered this track live some 20 years earlier whilst touring as Ziggy Stardust and the Spiders from Mars. David Hentschel - arp on "Hey Ma Get Papa"